Betsy Dumont is UC Merced's third dean of the School of Natural Sciences. 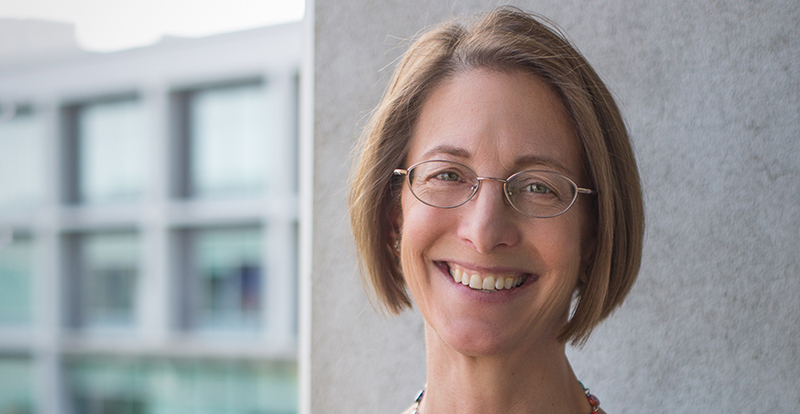 Elizabeth (Betsy) Dumont joins UC Merced today as the newest dean of the School of Natural Sciences. She’s the third dean in the school’s history and the second woman to serve in this capacity, after Founding Dean Maria Pallavicini. Dumont arrives from the University of Massachusetts, Amherst, where for the past three years she served as vice provost for academic affairs and director of the Interdepartmental Graduate Programs in Life Sciences. She joined the UMass faculty in 2001. “Dr. Dumont brings a distinguished and varied track record of leadership in higher education to UC Merced, as well as a strong interest in engaging faculty, staff, and students in strategic academic and administrative planning for the School of Natural Sciences,” Provost and Executive Vice Chancellor Tom Peterson said. Dumont attributes her cross-country move to UC Merced’s innovative, forward-thinking approach to research. Dumont’s own story is that of a scientist who refused to be confined by narrow academic boundaries. Dumont received her bachelor’s degree in anthropology from Indiana University and her master’s and doctoral degrees in physical anthropology from the Stony Brook University in New York. She completed postdoctoral work at the University of Pittsburgh, and was a research associate at the Carnegie Museum of Natural History. It was at the Carnegie Museum that Dumont the anthropologist became Dumont the chiropterologist — one who studies bats. Dumont recognized that bats, as the most diverse group of mammals, might be the ideal system for studying how biodiversity evolves. “People don’t realize that 20 percent of all species of mammals are bats,” she said. Along with her duties as new dean, Dumont intends to continue her research at UC Merced. She’s accompanied by a postdoc who will help set up her new lab, and she hopes to attract new graduate students. She also brings a 5-year, multi-institute National Science Foundation grant that funds her cross-disciplinary efforts. Dumont arrives with a grand vision for the School of Natural Sciences, with two ambitious goals topping her list of priorities. 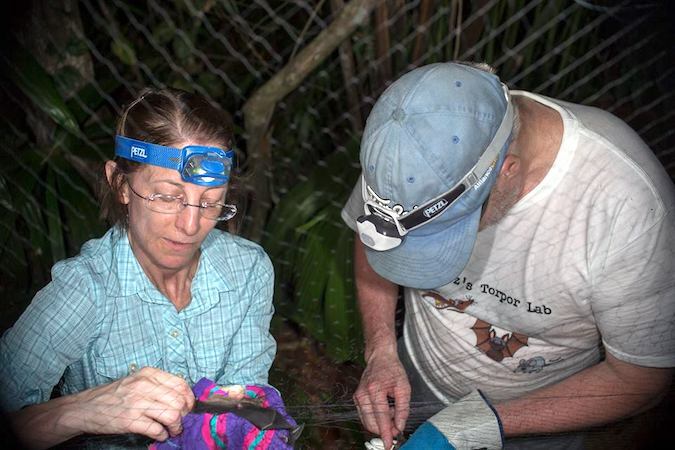 Dean Dumont (left) works with a collaborator to capture bats in the wild. First, she wants to help accelerate the university’s rapidly growing reputation for cutting-edge research, as evidenced by its inclusion in the Carnegie Classification of Institutions of Higher Education. Second, Dumont wants to improve outcomes for UC Merced’s unique student population, many of whom are first-generation students or come from underserved backgrounds. “I look forward to learning the routes that students take through the school and working together to help them complete their degrees as effectively and as efficiently as possible.” Dumont said. However, Dumont stresses that it’s not enough to improve four- and six-year graduation rates. She also wants to help students identify the opportunities that exist for them once they leave UC Merced.